Whilst jogging around Glasgow in recent years I have occasionally noticed in the pavement memorial plaques to firefighters who have lost their lives in the course of their work. This week I finally got around to looking into where this idea came from. On the 50th anniversary of the tragedy at Cheapside Street in 1960, where 14 firefighters and 5 members of the salvage corps died in a massive explosion at a whisky storage facility, a Firefighters' Heritage Trail was devised. 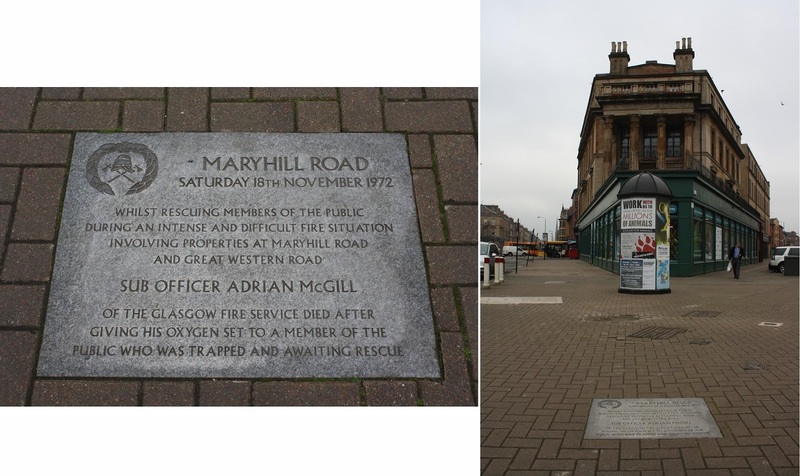 As a major port and industrial centre there have been many tragic fires in the city of Glasgow and memorial plaques have now been placed to commemorate these events, alongside a trail around further sites of special interest in the history of the Glasgow fire service. There is a guide and map available for more information from this website. The guide is also available here as a pdf. When I applied to go to university, my plan B had always been to apply to the fire brigade if I didn't get in. I was sure that I just about met the height requirement, but in the end I did get into uni, so never had to find out if I was quite the height I thought I was. Fire fighters are respected throughout the world for the dangerous work they do. As some of the stories from the past show, at times they are putting their own lives at risk to save others. It hardly seems right that their starting salary is only £21,000 for this, does it? I am training just now for a 10 mile race in Edinburgh in April, so looked out some points on the Firefighters' Heritage Trail to devise some longer running routes around Glasgow for myself. Here are a few of the things I came across. I started off at the old Maryhill fire station as I used to come to the steamie in this building with my mother when I was a child, living about 100 yards up Maryhill Road from here. The only time I had any dealings with the firemen here was when my parents brought us down to hand in food packages when they were on strike. Maryhill Burgh Halls now houses a leisure centre and swimming pool amongst other facilities, but these four sandstone arches show that Maryhill Fire Station once stood here, built in 1892. During restoration of the building, sculptor Andy Scott (creator of The Kelpies at the Falkirk Wheel) was commissioned to design the gates that now stand in the archways which the engines used to drive through. They show firemen with period dress and equipment. Until the 1960s there were three floors of tenement housing above the arches here, where the firemen lived. Not far from here is the fire station which replaced the old Maryhill station in 1941. Now converted into flats, the North West Fire Station was build during the Second World War and was home to the Glasgow Auxilliary Fire Service, one of the most modern fire stations in the country at the time. During 1994 this station attended 5000 calls. You can still see the five bays for the fire engines. I've visited someone in one of the flats here and was disappointed to find that there was no fiream's pole included. Shame. Next up is the new Maryhill Fire Station, which I pass often on the way to see Partick Thistle play at Firhill Stadium. Their website gives a very workaday description of the local area, not exactly in the same language which estate agents use. "Housing is mainly private sector, pre war flatted properties up to five storeys in height. The Dowanhill and Hillhead areas have many premises converted to student bedsit accommodation and pose access difficulties to the fire service. There are 44 blocks of residential flats of up to 25 floors. Industry is very sparse and consists of mainly light engineering." By contrast, here is a blogpost I wrote previously about Maryhill's past, when it was chock-full of industrial sites. The Firefighters' Heritage Trail also describes points of special interest in the history of the fire service in Glasgow. One site nearby is the ICL/Stockline Plastics Factory on Grovepark Street. On May 11, 2004 an explosion in the building caused it to collapse. Many of the workers inside were seriously injured and nine of them lost their lives. The first plaque I came across on this route is the one you may have seen at St Georges Cross if you've headed up to Firhill from the subway station here. There is a short video on the fire at Maryhill Road from the fire service website. In November 1972 a fire, which had been started deliberately in a disused wallpaper shop, spread to the tenement flats above. Over 200 people in the flats were evacuated including 15 rescued by ladders. Sub Officer Adrian McGill succumbed to smoke inhalation after giving his breathing apparatus to a resident trapped in a top floor flat. From St Georges Cross I headed under the M8 to Cowcaddens. Built in 1984 Cowcaddens Fire Station is the main station serving the city centre and motorway area now, and includes many modern training facilities. You have to admit though, it's a bit "functional" looking. The next memorial plaque I came to is at the top of Renfield Street. This commemorates the site of a fire and explosion in 1898 at W&R Hatrick's Chemical Works. The fire started in a basement but had quickly spread throughout the building. Believing the fire was coming under control, some of the firemen had entered the building to continue work on it when a loud explosion caused most of the building to collapse. Four men lost their lives. Another plaque lies around the corner from here at the top of Hope Street, outside of the Theatre Royal, but is currently obscured by the building work going on here. In 1969 whilst tackling an extensive and difficult fire in the sub-basement of the STV studios at the Theatre Royal sub-officer Archibald McLay died. See video above for more info. Outside of Central Station is a bronze sculpture by Kenny Hunter, "Citizen Firefighter". It is meant as a tribute to firefighters past and present. It became a focus for people paying tribute to the firefighters of New York who lost their lives in the 9/11 attack, 3 months after the statue was unveiled. On the south side of Royal Exchange Square, just outside the door of Light nightclub lies a memorial plaque to Fireman John Harrison. In 1856 teams of drummers had to take certain routes past houses in the city where firefighters and volunteers lived, to alert them to a fire requiring their work. Fire pumps were then collected from various sites and hand pushed to the fire. A fire started in the offices of a calico printer and quickly spread. Harrison was a slater to trade, 27 years old and married with two children. He was inside the building when joists collapsed down upon him in the fire. Nearby on Queen Street, lies another memorial plaque, opposite the Glasgow Gallery of Modern Art. In 1832 a fire had engulfed 24 properties here in Queen's Court when James Bruce and other volunteer firemen were called to the scene by the beating of a drum. He fell from the top of a ladder whilst tackling the blaze, onto a metal fence below. He had a wife and seven children. The next memorial plaque that I came to was on Argyle Street at the foot of Miller Street. In July 1921 two firemen died whilst fighting a blaze which had started in Bowman's department store here, a draper's and home furnishings store. Although the fire started whilst the shop was open, the public were evacuated safely and the firemen were killed, according to a contemporary report in the Glasgow Herald, by wreckage from the blaze falling on them whilst they tackled the fire. Just along Argyle Street from here, opposite where Marks and Spencer's is now, there used to stand Grafton's Fashion Store. 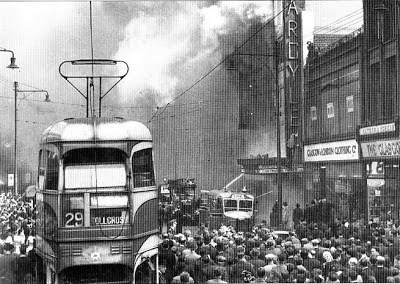 In 1947 a fire broke out in the crowded shop. Despite the efforts of the fire brigade 13 staff members from the shop died in the fire. They were all women, aged 15 to 23 years old. Two staff members from the shop were awarded the George Medal for heroism for rescuing five women. Shop manager and ex-paratrooper Solomon Winetrobe worked his way along a 5 inch-wide ledge on the top floor and persuaded the women to come along it to George Platt, a clerk, who helped them into a window of the cinema next door. Another city centre spot on the Heritage Trial is at James Watt Street, by the Broomielaw. This marks the spot where in 1968 twenty two employees of A J & S Stern's furniture factory died in a fire here when they were trapped behind the barred windows and padlocked emergency exit of the factory. The men and women who died were aged from 17 to 60 years of age. The windows were barred from the days that the building had been previously used as a whisky bond. 93 firemen were in attendance but unable to save them. Only three people managed to escape the building. Central Fire Station on Ingram Street was the second HQ of the Glasgow Fire Brigade, replacing the College Street Station (1851-1900). This was the last Glasgow fire station built to accommodate horse-drawn engines. Winston Churchill visited the firemen here in 1941 after a bombing raid. In recent times it has been occupied by a succession of restaurants, but despite the attractive building, none of them seem to have managed to keep going for very long here. One of the worst tragedies to befall the fire service of Glasgow was on 28th March 1960. The nineteen men of the fire service and Glasgow salvage Corps who died that day are commemorated by a tomb within the Glasgow Necropolis, beside Glasgow Cathedral. Other firefighters who died at their work are remembered on the other side of this stone, including the seven men who died in the Kilbirnie Street fire in 1972. Every year these people are remembered by their colleagues as you can see by the fresh flowers laid here. The Firefighters' Heritage Trail is another way to make sure that the sacrifices made by these people are remembered and that we don't forget the lessons from these tragedies. Down in Partick another old fire station now converted into a block of flats hides away on Beith Street. Compare this classy building to the picture of the utilitarian modern Yorkhill fire station above it. Partick fire station which opened in 1907 sits about 50 yards away from where Partick Thistle played their matches in their Meadowside ground down by the Clyde until 1908. It was built for horse drawn fire engines, with stabling for 8 horses. In 1941 it suffered a direct hit during a German bombing raid. From here I like to run through the Clyde Tunnel cycleway, which has been given a fresh lick of paint recently, and head over to Govan. Old Govan Fire Station, in Orkney Street served communities on the south of the river and in the shipyards for almost 100 years before it was replaced with the new Govan Fire Station opposite here, on Govan Road. The fire station was housed at the rear of this building which, as at the old Maryhill fire station, was also home to the Police and the town hall until the new Govan Town Hall was built in 1899. The next memorial stone that I came across was just outside the Glasgow Science Centre, at Prince's Dock. This marks the spot where in 1960 a fire broke out upon a German cargo ship called M.V. Pagensand. It was carrying matches, wood pulp and paper which had been smouldering in the hold for two days before it came into port in Glasgow. Overcome by fumes 11 fireman and one docker were hospitalised trying to tackle the fire. Station Officer Douglas Mearns was in charge of the St Mungo fireboat, part of the marine division of the Glasgow fire service at that time in what was one of the world's busiest ports. Despite entering the boat wearing breathing equipment he was quickly overcome by the sulphorous fumes and died. He had a wife and three children. In the middle of all the gap sites of old Tradeston lies the handsome old South Fire Station on Centre Street, the first fire station in the city purpose built to have motorised fire engines. Nearby lies Kilbirnie Street. The memorial plaque here marks the site of a warehouse fire that claimed the lives of seven firefighters in 1972. When one of their colleagues got trapped inside whilst evacuating the building, six firemen entered the property to try to rescue him. They were overtaken by a massive flashover of extreme heat which killed them all. The bodies of six of the seven men were interred in the Necropolis, alongside the Glasgow firemen who had died 12 years earlier at Cheapside Street. The plaque on Cumberland Place tells a sad story. "Whilst attempting the rescue of four children from a dwelling house fire Station Officer William Clark of the Glasgow fire service and the four children died during the rescue attempt". An overturned paraffin heater started a fire in a council house in Hutchestown, in the Gorbals on the 15th of November 1967. The children were all aged under 6 years of age. Sadly I had a relative that died in a fire involving a paraffin heater too, which shows the way in which fire dangers change with the times I suppose. One other plaque on the southside which I didn't manage to visit tells the story of another fatal fire. On the 20th of March 1971 whilst tackling a fire on Deanston Drive in Shawlands, Station Officer James Mathieson, aged 49, was overcome from the strenuous efforts of tackling the fire in a top floor flat here. He had three children, the oldest of whom was to be married the following week. The plaque is located at the corner of Deanston Drive and Strathyre Street. Heading into the East End, the first point on the Heritage Trail I came to marks the spot where 29 women died when part of the wall of an extension being built on the Templeton Carpet Factory collapsed in high winds on 1st November 1889. The Eastern and Central Fire Brigades attended the scene to search for survivors, and many women were rescued from the weaving shed on Glasgow Green which had been adjacent to the collapsed wall. The 29 women who died were aged between 14 years and 25 years old. A small memorial garden commemorates their deaths, with a sandstone plaque that was placed here in 1954, at the bottom of Tobago Street at London Road in the Calton. Their names and ages are also now recorded here. (This is often confused with the death of six Calton weavers in 1787 when their strike was violently suppressed by the city fathers, which is commemorated with the nearby Calton weavers' gate and in Calton cemetery). Next up was a short hop to the Gallowgate at Graham Square where a plaque outside the Drover pub commemorates the fire in 1927. The old building facades have been preserved here with modern homes behind them, a shadow of the former grandeur of this part of town. On Christmas Eve 1927 the firemen were called away from festive celebrations with their families to attend a warehouse fire at Graham Square, which formed one entrance into the old cattle market. Four of the firemen died whilst tackling the blaze, made more tragic by the timing of it at Christmas. Hunter Street has the new Calton fire station at the bottom end of it, between the Barrowlands ballroom and Morrisons. The top end is now all gap sites, but was once the home of a large railway complex. The North British Railway Company had their "mineral terminus" at this end of Hunter Street and the central fire brigade were called from Ingram Street to a fire at the oil gas producing works here in November 1904. Fireman William Rae, who was a joiner to trade, died from his injuries when a boiler exploded in the fire. He had a wife, and four children all aged under 10 years old. One other disastrous fire recorded in the Heritage Trail occurred in a lodging house in Watson Street, Glasgow in 1905. Less than a mile from where the notorious Bellgrove Hotel stands now, Watson Street was once home to several lodging houses, including two owned by William Nicol, a member of the Town Council. 200 of the city's poorest working men lived at one of these houses at 39 Watson Street, crammed into wooden cubicles. Despite the efforts of the fire brigade an inferno swept through the building and 39 men perished. This contemporary news report gives a harrowing account of the events. The Firefighters' Memorial Trail around Glasgow is a good way to remember those who lost their lives helping others. It also reflects the history of Glasgow, when its rising industries, chemical plants, warehouses and docks earned it the nickname "Tinderbox City" for a while. The trail was put in place to commemorate those who lost their lives at the fire at Cheapside Street, so that is where I will end. Cheapside Street is now an empty street parallel to the Kingston Bridge. In 1960 it was home to a whisky storage warehouse that contained over a million gallons of rum and whisky. 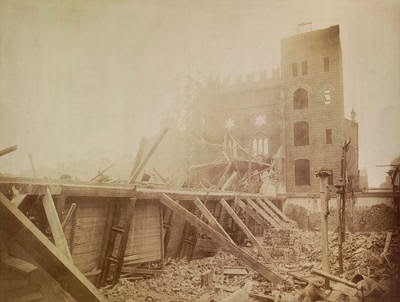 Whilst tackling a serious fire here on the evening of 28th March 1960 a sudden explosion within the building blew out the walls and falling masonry resulted in the deaths of 19 firefighters and members of the salvage corps, Britain's worst ever peacetime disaster for the fire service. A ten minute video here marks the events that night. Every single appliance in the city was called to fight the fire, including the fireboat on the Clyde as it spread to a neighbouring tobacco warehouse, ice cream factory and the Harland and Wolff engine works in the narrow streets nearby. The Heritage Trail is a useful way to hear about the stories of the important people and incidents in the firefighting history of Glasgow. I hope that I've encouraged you to have a look at their website and visit some of these sites.